Situated in northern Fujian Province, Nanping City has an area of 26.300 square kilometers and a population of three million. The industrious and intelligent people in northern Fujian invented the Shunchang bamboo paper, the earliest paper in China's printing history, and the Masha woodblock printing technology manufactured black glazed porcelain that holds an important position in the history of China's porcelain industry; and created a tea processing technology famous in and outside of China. At present, a tourist network consisting of more than 150 scenic spots have been formed. 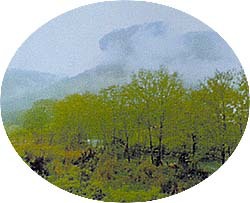 The network includes Wuyi Mountain, one of the first batch of major scenic areas designated by the state and a nationals tourist resort, at the center which links the Wuyi Mountain Nature Reserve, Mangdang and Jiufeng mountains in Napping, Guizong Hill and Wanmu Wood in Jina'ou, Zhanlu Mountain in Songxi, Donggong Mountain in Zhenghe, Fugai Mountain in Pucheng, the site of the Song Dynasty porcelain kiln in Jianyang, the ruins of a Han Dynasty town in Wuyi Mountain, Xichun Park and the Temple of Li Gang in Shaowu, and Wujun Mountain in Guangze. It is in the southern suburbs of Wuyishan City. Wuyi Mountain formed of red sandy gravels is a low-lying hilly land belonging to the Danxia landform. Over the ages, crustal movements have caused a constant change of the landform and formed a unique landscape of the crystal-clear Jiuqu Stream that winds its way in the mountain, 36 peaks of varied shape, 72 caverns, and 99 crags. The enchanting Wuyi Mountain is the "finest in southeast Fujian." Known as the Lesser Wuyi Mountain, Guizong Hill is at the mouth of the Yijun Stream, 15 kilometers north of Jian'ou City. It is a low-lying hill, with its highest peak rising 596 meters above sea level. There are ten scenes, three caves, and one temple. These include Tingquan Pavilion, Shixin Spring, Lingxu Terrace, Xianglu Peak, Luozhu Cliff, and the Chongren Buddhist Monastery.